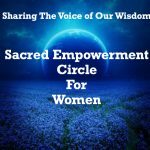 My passion and commitment are to women of age who have been disempowered by a lack of self identity, loss of purpose and spiritual disconnection. This can be brought on by a transitional life crisis that includes chronic and terminal illness, job loss, broken relationships, grief, harassment, discrimination, loss of faith, and personal emotional stress/distress. I experienced my own disempowerment due to the loss of a 25 year career in corporate dental practice management and allied health career school education caused by an extreme onset of Fibromyalgia/Chronic Fatigue. Eventually, I was led to attend a four day healing experience in San Francisco, CA, which became a personal healing journey. My life was transformed emotionally, physically and spiritually through The Body Story Experience. I experienced intense inner healing, spiritual awakening, and intuition which became the foundation for living my life Authentically, while Confidently Expressing my Voice with Passion, Power, and Purpose. I am the owner of Career Path Success, LLC, and through retreats, workshops, blogs, private Reiki practice, phone guidance sessions, and Sacred Circles for Women, I gently guide clients towards a shifting of their minds and energy to powerful thoughts, emotions, and actions of personal transformation, freedom and soul awakening. Certification from the Missing Thread Mystery School in San Francisco, CA in Reiki Master/Teacher, Death Midwife, and Body Story Expert. Continued in-depth training in shamanism, intuition, and mysticism from The Missing Thread Mystery School and Shaman Drake Bear Stephen of Innerprizes in San Francisco, CA. My skills, studies, and research into mysticism, metaphysics, energy, mind/body balance, meditation, end of life issues, different healing modalities and modern psychology advance daily, as I seek to blend ancient spiritual knowledge with modern day lifestyles, belief systems, and careers. As a professional speaker, I have conducted numerous spiritually based presentations as well as professional dental presentations at national, state and local dental conventions. My life is blessed with a wonderful, supportive husband named Jack Deering, and our family includes five adult children, many grandchildren, and our furry family of two dogs and one cat. Jack and I live on four magical wooded acres in the rural Amish farmlands of Wayne County, located outside Wooster, Ohio. I work in a small white cabin, called The Healing Cottage, nestled in the woods of our property, where I hold many successful retreats and workshops as well as my thriving Empowering Reiki practice, Sacred Empowerment Circles for Women and Conscious Empowerment Career and Personal Success Intuitive Guidance Sessions.